This is such a terrible story in itself–but could it be there’s even more here to become aware of? What is it about the healing practices, research, and treatment protocols of these doctors that caused them to suddenly become missing or dead? What is it about GcMAF and Nagalase that’s causing such an extremity of violence aimed at holistic/alternative medical practitioners? Is GcMAF actually a key to curing a whole host of illnesses that allopathic medicine tells us it’s impossible to find a cure to–cancer, autism, AIDs, auto-immune diseases, neurological diseases like Parkinson’s and Alzheimer’s and Multiple Sclerosis, etc.? Some researchers think so–and maybe there’s more than one industry here–not just the cancer industry or the vaccine industry–that’s beginning to panic and lash out. There’s already a tremendous amount of interest online in this story–and I actually think that is a good sign, because it means people are waking up to the horrors of what is going on around us--until we wake up and make dramatic changes in how we live and how we govern ourselves, we’re going to keep turning a blind eye to these atrocities that are mounting against us, for they’re not stopping–and frankly, when wonderful, caring, compassionate, intelligent, dedicated healers in our midst are killed, we Need to wake up. I also get the feeling this story is going to just keep growing–and watch how mainstream media tries to tear it down (with talk of “conspiracy theories” )–but maybe instead it will become a launching-off point to bringing a huge number of issues together. The other two doctors she mentions are Dr. Nicholas Gonzales, and Dr. Jeffrey Whiteside–her article is detailed and well worth the read. Dr. Gonzales died 4 days ago–July 21–of apparent cardiac arrest, even though he had been in excellent health. Two days ago–July 23–Dr. Whiteside, earlier reported missing, was found dead with a .22 by his side. This is happening right now, as we speak–these latest deaths happened This week! It’s absolutely atrocious, and it needs to stop. We need to openly challenge these reported stories of supposed-suicides which in every way announce themselves clearly instead as covert homicides. There’s one point I want to make here, which will come as no surprise to those aware of Electromagnetic Radiation/Sonic Weapons in our midst: It’s entirely possible several of these doctors were killed with a Remote Heart Attack Weapon, a Directed-Energy Weapon (DEW) currently in use under classified protocols by our military and Intel agencies, and possibly, just possibly also sanctioned for use on “Targeted Individuals” illegitimately labelled “Domestic Adversaries” by our Department of Justice. It’s entirely possible that gunshot wounds, gunshot residue, and guns planted at their side were planted to cover up any hint of death by DEW, and to create externally visible material evidence (since many DEWs would just destroy organs internally). Nagalase–much like our current television culture afflicting the general populace–literally puts GcMAF, our Immune System Superheroes, to sleep. Also not unlike our television culture with its baggage of subliminal advertising and mind-control, which seems to seep out from covert Mass Control mavens–and covens, Nagalase seeps out from cancer cells and viruses. Elevated levels of Nagalase have been found in patients afflicted with cancer and autism. 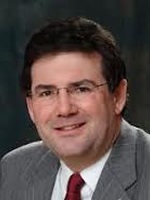 Dr. Timothy Smith, like many other doctors, believes in the importance of Nagalase screening as an early screener for cancer and other diseases. Nagalase has become a recognized early-marker of cancer in the body, and Nagalase screening tests exist, as this site, Nagalase Blood Tests demonstrates. Dr. Yamamoto, who discovered the GcMAF/Nagalase mechanism in the body performed and reported on several clinical trials using GcMAF on cancer patients. This research is reported in Dr. Jeffrey Dach’s July 2013 article at Op-Ed News, Cancer ImmunoTherapy from Dr. Yamamoto. From the beginning of the article: “This article explores the work of Dr. Yamamoto, who discovered the Macrophage-Activating Factor (GcMAF) in 1990 at the Socrates Institute in Philadelphia (4). Since then, Dr. Yamamoto has published three human clinical trials showing remarkable results for breast (5), colo-rectal (10), and prostate cancer(11). What is MAF — Macrophage-Activating Factor? MAF is a protein that activates our macrophages, the microscopic white cells that kill invading microbes and cancer cells. MAF is made from a precursor protein called the Gc protein. Dr. Yamamoto devised a technique for restoring Gc-protein activity, which creates the most potent macrophage-activating factor ever discovered, having no adverse effects. He called it GcMAF. 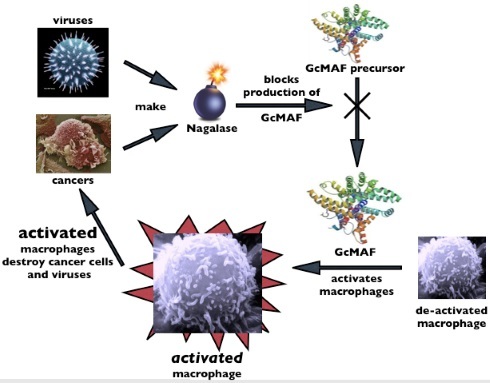 Macrophages treated in vitro with GcMAF (100 pg/ml) are highly effective at killing breast-cancer cells. Dr. Yamamoto then studied his GcMAF in human metastatic breast-cancer patients with weekly injections of 100 ng of GcMAF (5). Dr. Yamamoto found that over time, as treatment with GcMAF progresses, the MAF-precursor activity of patient Gc protein increased, and the serum Nagalase decreased (5). After 5 months of weekly GcMAF injections, the cancer patients’ elevated Nagalase activity had returned to normal levels, same as healthy controls. Over the next four years, these sixteen treated metastatic breast-cancer patients remained cancer free with no recurrence (5). In 2008, Dr. Yamamoto published his landmark study on human breast cancer. (5)” Please visit Op-Ed News for the whole article. 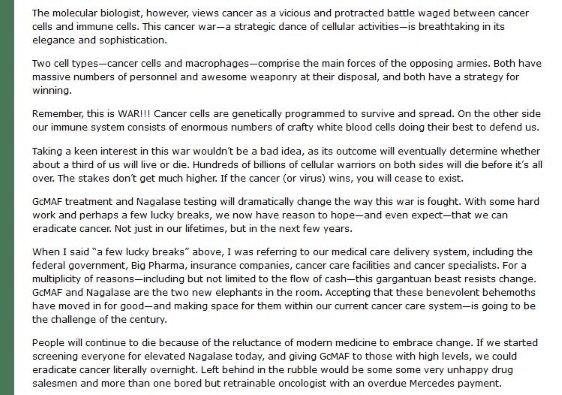 According to Dr. Timothy Smith, it is possible to envision a time when Nagalase screening will permit the early detection of early stages of cancer, the best time to begin a successful round of GcMAF therapy, which he cautions may be most effective only in the early stages, and in cases where the “tumor burden” or size is fairly low, not high nor in an advanced state of metastases. But it is important to be open to a screening methodology that is molecular or biochemical rather than waiting for a tumor to materialize first. In terms of cancer, the bottom line here is that practicing the best possible medicine will force us to dispense with the luxury of palpating the mass or seeing it on an X-ray. Lives will be lost if we stay stuck in that groove. The best doctors will be using newer biochemical techniques to find disease early. When rising Nagalase levels expose these early occult cancers, the first line of therapy will be GcMAF (100 ng/week, intramuscularly), along with immune strengthening, anti-cancer nutritional medicines. If the GcMAF program works, the Nagalase level (which should be checked monthly) will go down and the doctor and patient can rest assured that the cancer is going away. We’ll sleep better at night. As mentioned above, it may seem bizarre and surreal to be treating a cancer that is still invisible, but this is exactly what is happening—and it works. Dr. Yamamoto’s studies showed that with GcMAF it works 100% of the time. Next, Nagalase and autism: Dr. Jeff Bradstreet, who had become renowned for his research into various methodologies of treatment for autism, had become interested in the GcMAF mechanism, and conducted various studies where he discovered elevated levels of Nagalase in children with autism. He reported on these studies, and he wrote about his findings on his blog and elsewhere online. Although my daughter is not a patient of Dr. Jeff Bradstreet I’ve always had an enormous amount of respect for the good doctor. I’ll usually go on his website once or twice a month to find out what has most recently attracted his interest. Often it seems we’re looking at similar questions; which either means great minds think alike, or we suffer from some of the same delusions. I was intrigued by his October 11, 2011 entry, “An Update on Viral Issue in Autism” since it dovetailed with some of my own recent investigations. In the past months Dr. Bradstreet has become interested in nagalese, which he describes as an enzyme “produced by cancer cells and viruses.” He thinks it unlikely that children with autism have undiagnosed cancers, and thus suspicion falls on a viral etiology. Dr. Bradstreet writes, “Viruses make the nagalese enzyme as part of their attachment proteins. It serves to get the virus into the cell and also decreases the body’s immune reaction to the virus-thereby increasing the odds of viral survival.” Read the whole article at Age of Autism. “We have now evaluated approximately 400 children with autism for the viral marker, nagalase. From my perspective this is one of the most important developments in the clinical treatment of children on the spectrum that I have experienced in the last 15 years. The short story is nearly 80% of the children with autism evaluated have significantly elevated levels of nagalase. The enzyme nagalase is produced by cancer cells and viruses. Since it is clear cancer is not feature of autism, it is most likely viral mediated enzyme activity (although in rare cases children with autism could have an undiagnosed cancer – this is unlikely). Viruses make the nagalase enzyme as part of the their attachment proteins. It serves to get the virus into the cell and also decreases the body’s immune reaction to the virus – thereby increasing the odds of viral survival. As previously stated on this blog – the target of nagalase is the GcMAF or Vitamin D3 receptor. It is capable of inactivation of this cell receptor and reducing both Vitamin D function and immune function. Dr. Bradstreet’s study on Nagalase and autism titled “Initial Observations of Elevated Alpha-n-Acetylgalactosaminidase Activity Associated with Autism and Observed Reductions from GC Protein—Macrophage Activating Factor Injections...” can be downloaded as a pdf from this site. So What is the Connection Between Nagalase and Vaccines? As noted above, in light of all the studies on autism patients with elevated levels of Nagalase, the understanding among several researchers and analysts, as also Dr. Jeff Bradstreet, is that this elevation is due not to cancer but to viruses. “Dr Jeffrey Bradstreet has now treated over 2,000 autistic children with GcMAF and the results are well established. In 15% GcMAF makes no difference. 85% improve, if only a little, and of them 15% have their autism eradicated. In all 3,000 children have been treated with GcMAF with similar results. Autism is usually a viral disease to a greater or lesser extent, with viruses in the brain and the stomach. In 15% of children viruses are negligible, and GcMAF probably will not help. In 85% viruses are involved, and they will respond to GcMAF. In 15% of children autism is mainly a viral disease, and these children make full recoveries. Children can begin to respond inside 5 weeks. If nothing happens in 16 weeks, their autism may not be viral. 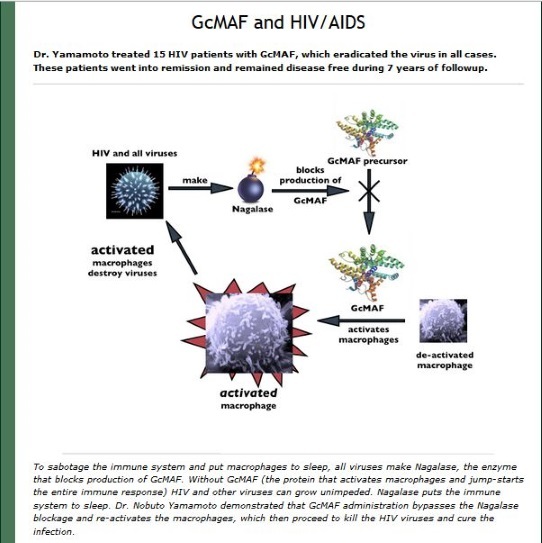 If they respond, GcMAF should be continued for typically 24 weeks, or 8 weeks after they appear to be recovered, to ensure the viruses does not return. GcMAF has three excellent effects in the brain and rebuilds the immune system, which then attacks the viruses that cause autism. Improvements in the child are often seen as early as five weeks – about the same time it often takes to permanently eradicate the herpes virus.” More information at their site. This issue, I’m aware, is controversial, and needs more research. But that’s the gist of it, that the live viruses in vaccines or viral material included otherwise have an impact on immune systems via the Nagalase that comes along with “the envelope protein” of the virus. Isn’t all this eye-opening enough…but there’s more. Could GcMAF Offer The Promise of A Cure For More Than Cancer and Autism? Human GcMAF, otherwise known as Vitamin D binding protein macrophage activating factor, holds great promise in the treatment of various illnesses including cancer, autism, chronic fatigue and possibly Parkinson’s. Since 1990, 59 research papers have been published on GcMAF, 20 of these pertaining to the treatment of cancer. 46 of these papers can be accessed through the GcMAF web site. GcMAF is a vital part of our immune system which does not work without it; and is part of our blood. 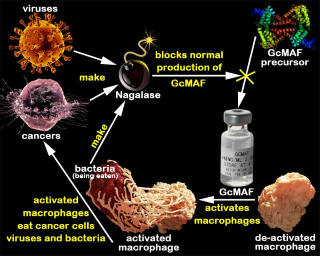 GcMAF stimulates the macrophage element of the immune system to destroy cancer cells. It also blocks the supply of nutrients to cancer cells by stopping blood vessel development to the site (anti-angiogenesis). Cancer cells are weakened and starved, making them more vulnerable to attack by the GcMAF stimulated macrophage system. Research has shown macrophage activation and stopping diseased blood vessel development can also help in various neurological diseases such as Parkinson’s, Alzheimer’s, rheumatoid arthritis, inflammatory conditions, and diabetic retinopathy. In the case of autism, Dr. James Bradstreet has so far treated 1,100 patients with GcMAF with an 85% response rate. His results show a bell curve response with 15% of the patients showing total eradication of symptoms and 15% showing no response. In addition, experimental and clinical evidence confirms that GcMAF shows multiple powerful anti-cancer effects that have significant therapeutical impact on most tumors including breast, prostate, and kidney. GcMAF is created in the body by the release of two sugar molecules from a GcProtein molecule. However, tumors release an enzyme known as Nagalase. 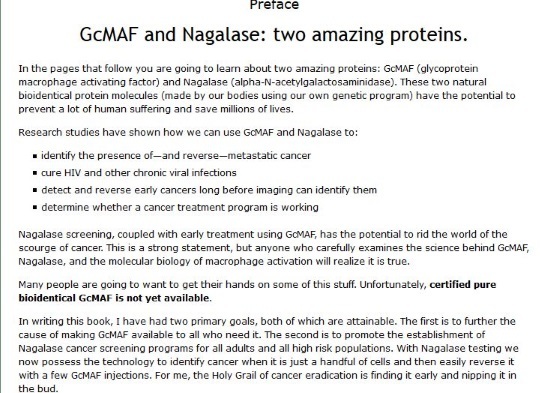 Nagalase degrades GcProtein to the point it is unable to become GcMAF. Since GcMAF only lives for about a week in the body, without continuous conversion of GcProtein the stores of GcMAF are depleted rapidly in the presence of Nagalase. 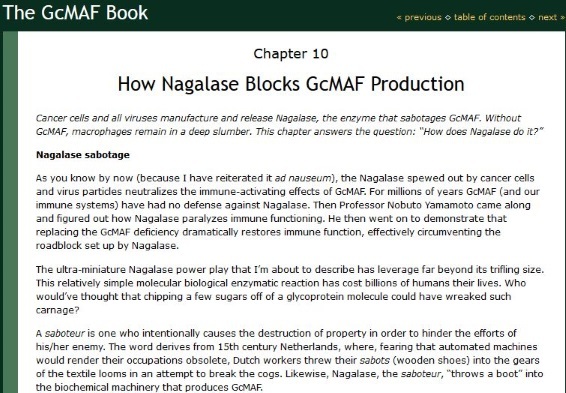 However, Nagalase can only destroy GcProtein and not GcMAF. Thus the introduction of external GcMAF through injection into the body has been shown to be effective. Read the whole article at the FAIM website. There’s discussion elsewhere online about the magical promise of GcMAF therapy in any kind of immune-system disorder, including auto-immune diseases. “Further evidence supporting the GcMAF and nagalase story, which seems to be behind the elimination of several alternative medicine doctors has come forth in the form of a search warrant for Dr. Bradstreet and his offices. This search warrant was targeting GcMAF and those who have been treated with it. This video discusses it and here is the link to download the search warrant. Below are the pages from the search warrant spelling out what they were looking for. I think this clears up any uncertainties about what is going on here, and it is horrific. How Does This Affect Every One of Us? Dr. Timothy Smith, author of The GcMAF Book, suggests that the reason this subject matters to every one of us, eventually, is the increasing pervasiveness of cancer. In his opinion, cancer could be eradicated virtually overnight by screening everyone for high Nagalase levels, and giving GcMAF to those with high levels, thereby jump-starting their own immune systems to attack the incipient or extant or proliferating cancer cells, instead of having these people (the majority of us in today’s EMF and pollution-riddled world?) just putter along toward oblivion with a deliberately deactivated immune system gifted by Nagalase secreted by beginning cancers or viruses in the body. Please share this information widely so more of us can fully understand what is at stake here–ruthless suppressions of cures for cancer and other diseases, ruthless silencing of our best and brightest researchers and healers who challenge the status quo–we shouldn’t stand for it.